Taiwan's best-kept secret is hidden in plain sight: islets of green dotting the crystal blue of Taiwan Strait, a community off the west coast of mainland Taipei. Its white-sand coasts and majestic basaltic formations are touched mostly by sunlight and breaking waves, away from the destructive hand of humans. Penghu, a coastal paradise 260 km from Taipei's urban hubbub and night markets, belongs to a not-so-discreet list of the "Most Beautiful Bays in the World (MBBW)." It joins, among others, the Philippines' Puerto Galera Bay in Oriental Mindoro province. Its strength, Penghu County governor Kuang Fu-chen says, is its tight-knit community of locals who have taken it upon themselves to preserve the archipelago. Penghu is home to at least 100,000 people caught in a delicate balancing act between two vital, yet opposing, forces: fishing and booming tourism. At least 90 islands make up Penghu, an hourlong flight from Taipei to its capital city, Magong. Nineteen are inhabited, while the rest are untouched sanctuaries of marine life. So rich is Penghu's natural diversity that even its rocks carry historical weight, said Taiwan geopark association president Jiun Chuan-lin. Its landscapes and rock formations, formed by waves, winds and workers' hands, carry "the long history of Penghu residents' activities and their heritage," he said. These include the Twin-Hearts Stone Weir on Qimeiyu Island, a well-preserved ancient fishing trap forming a flying heart near the coastline. Penghu is also a storied archipelago that served as one of Formosa's best defence strongholds, from the Ming Dynasty in the 1600s, to the Japanese occupation in the 19th century. Remnants of its war-torn past still exist on Xiyu Island, where several forts, including the Yumengdao Lighthouse, dot the former military stronghold. 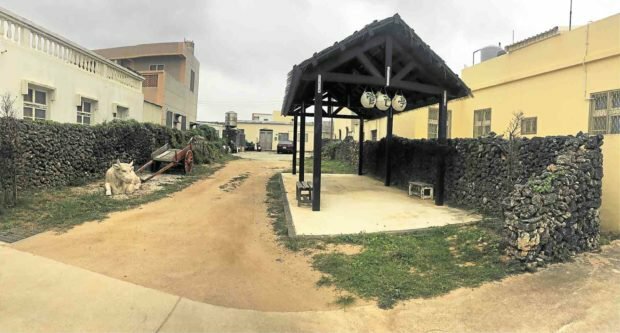 But as other natural wonders contend with the destructive forces of tourism, Penghu's biggest environmental problem is the ocean itself, Ma Chin-tsu, Penghu's environmental protection bureau director general, says. Penghu is caught between the crosstides of the China cold coast current to its west and the Kuroshio (Japan) current to its northeast. Because it is completely waterlocked, Ma said, its otherwise immaculate coastlines are often contaminated with sea drift. Its picturesque Jibei sand peninsula and Longmen beaches, for example, are often filled with plastic waste from neighbouring countries. Half of these are PET bottles identified as Chinese-made, while the other half comes from other Southeast Asian countries like Thailand, the Philippines and Indonesia. Penghu residents usually clear an average of almost four million tons of garbage a year from its coasts. "It's almost as if Penghu is a stopover for waste," Ma lamented. "It has become a cemetery for garbage." As such, the county engages its residents in regular coastal cleanups. It's also invested in longer-term solutions, like high-tech recycling and requiring businesses to reduce plastic packaging. Students are even required by law to visit natural landscapes to learn more about the importance of environmental education, Jiun says. Setting foot in Penghu Islands feels like stepping into an anachronism. In Magong City, five-star hotels and malls stand across the marina where ships and yachts are berthed. But drive deeper away from the hub, and the cars and pedestrians dwindle to nil. The landscape goes from urban modernity to ornate red-and-gold temples, Japanese classical homes, and former military outposts, until the roads wind toward the blue ocean. As climate change morphs into a politically charged issue, Taiwan is intent on setting an example for responsible environmentalism in Penghu, even if it is being squeezed off the global stage by China, said to be the world's top pollutant. Penghu's stake in the climate debate is exemplified in its oldest villages, Nanliao and Beiliao. Only 500 people live in Nanliao, one of Taiwan's oldest farming communities. Its coral walls perfectly preserve its ancient rural architecture and illustrate how closely tied Penghu's villages are to the ocean. Nanliao Village is one of the oldest villages in Penghu county. Home to less than 500 people, its coral wall architecture perfectly preserves Taiwan’s rural life and best illustrates how closely Penghu’s villages are tied to the ocean. Beiliao is Penghu's most traditional fishing village. Its aging community, mostly fisherfolk, still practices longline fishing to preserve its seascapes. It's perhaps best known for its bearded croakers, often used in some of Penghu's signature seafood dishes. Its indelible ties to the ocean have made Penghu more committed to managing marine pollution and to eco-sustainability, said governor Kuang Fu-chen. What makes the effort even more impressive is that Taipei is not even a member of the United Nations (UN). "Our determination to engage with the world and strengthen Taiwan's global contributions has never faltered," President Tsai Ing-wen told Penghu's residents in a speech. "Even though Taiwan is not a member of the UN, we continue to work hard and seek opportunities to co-operate with the UN's 17 Sustainable Development Goals," she added. But Penghu's efforts must be reciprocated on the global level for these initiatives to work, Ma Chin-tsu said. This means making the governments, whose debris regularly ends up on its coasts, manage their wastes. "The ocean is Penghu's lifeline, the mother of its people," Ma said. "The governments and people must work together to keep Penghu a beautiful place."